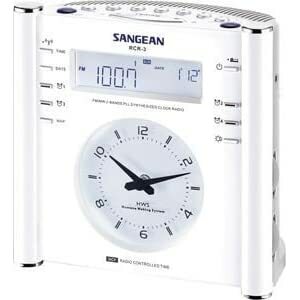 I really like the Sangean RCR-3, which is the nicest bedside, clock radio I've personally owned. I'm a time geek, so having a radio that auto-sets time is a must (either by Internet, satellite radio, or WWVB.) The RCR-3 has all the features I want in a clock radio -- highly adjustable light (has a bright/dim switch and fully adjustable level for dim); push button selection of AM/FM; reasonable sound; compact size; four alarms; analogue and digital clock; very sensitive on FM; smaller footprint etc. From what I can gather, the alarm system of the RCR-3 is much simpler than the RCR-1 -- there are four alarms (which can be configured by day if you wish) -- you turn it on by pressing a front panel button, which lights up a (not-too-bright) LED -- independent for each alarm. Actually, I really like the alarm system of the RCR-3 (except for the lack of battery in case the power goes out). The humane alarm system is great -- the max volume is adjustable -- and it not only increases in volume, but goes (in wake-to-alarm) from a single beep to a double beep to a triple beep to a quadruple beep. The lighting system of the new one is great -- one button push to max lighting -- dim lighting is fully adjustable (down to "off") -- and the LED lights both the digital and analogue display. For me, a clock radio is mostly about the clock -- but I have to say, the radio on this unit is quite respectable. I've had the similar Sangean RCR-1 for several years. I can't rave enough about Sangean's alarm ("Humane Waking System"). When the alarm goes off, the display switches from blue to bright orange, and the alarm gradually (slowly) increases in volume. If you hit snooze, the display dims but remains orange until you turn the alarm off. I realize this may sound trivial, but once you are used to it, it is awesome. There are a couple of disadvantages... The RCR-1 clock is hard to read in the dark (looks like the new one might be easier to read), and setting the alarm is non-intuitive - it took a long time before I "got it". The snooze is also too short (I believe it is five minutes, and is not adjustable).